It seems everywhere I go lately I’m looking at sous vide cooking in some form or another. Whether I’m talking with fast casual restaurants or fine dining, sous vide is pushing in as a mainstream option for cooking. And as sous vide technology becomes more accessible, why wouldn’t it? Sous vide offers an excellent opportunity for perfectly cooked, high quality foods to be finished quickly in restaurants reducing fire time and increasing customer satisfaction. With that in mind, our friends over at SousVideWizard.com set up this excellent guide on sous vide cooking, complete with pretty much everything you need to know! So without further ado, Here is the Official Guide to Sous Vide Cooking. Here’s Everything You Need To Get Started With Sous Vide! If you are a chef or simply know your way around a kitchen, chances are that you have at least heard of Sous Vide cooking. However, if you have heard of it, but never tried it, chances are that you are a bit confused about how to get started with your new Sous Vide cooker. It can be difficult to determine where you should start and what you should try to cook first.This guide will provide you with all of the information you need in order to get started as a sous vide cook. Not only will the guide discuss all of the tools that you will need in order to get started, but it will also provide you with some basic recipes to try out. These simple recipes are delicious and will show you why this method of cooking allows you to do even more in your kitchen. FIRST THINGS FIRST, WHAT IS SOUS VIDE? Sous Vide refers to a cooking technique that was developed by the French. Sous Vide translates to mean “under vacuum.” During this cooking technique food is first vacuum sealed within a cooking pouch. It is then heated up to a precise temperature using a water bath. Instead of relying on precise cook time, a Sous Vide chef relies on making sure that the temperature of the water bath remains controlled. Just imagine the last time that you cooked a steak. Chances are that you know the exact texture and color or doneness of the steak that you like. Now think about how you prepared the steak and all of the techniques that you used in order to get it exactly the way that you want it. When cooking a steak using the sous vide method you will simply set a pot of water to the correct temperature and time and you will get the perfect doneness every single time. While sous vide cooking is just recently becoming more popular with home cooks, professional chefs and many restaurants have been using this method for many years. It is actually a relatively simple method that you can use in order to improve many of your favorite meals. This method allows you to remove the stress from cooking or at least the stress from making sure that your protein is cooked the way that you like it and allows you to focus on making more creative sauces, side dishes, or desserts. HOW DOES SOUS VIDE WORK? Now that you know what sous vide is, you may be wondering exactly how it works and why it is a better method than the more traditional methods that you are likely familiar with. Here is a short explanation. When it comes to traditional methods of cooking the heat flows from a burner to the pan and then to the food or if baking something in the oven the elements from the oven will heat up the air around the food and cook it. Since the heat from the pan and the heat from the oven are much hotter than you want the food to be, cooking the food correctly will require you to take it out of or off of the heat at the perfect moment. If you take it out too late the food is overcooked, if you take it out too early it is undercooked. When you cook using water instead of a pan or the oven, you are able to raise the temperature enough to get the food to the exact temperature that you want it. You can take the food out as soon as it has finished cooking or you can let it rest in the water until you are ready to eat. There is no need to check the oven obsessively or standing over the stove. WHY CHOOSE TO LEARN SOUS VIDE? Now that you know what sous vide is, the question becomes, why learn to use this method of cooking? While the name sous vide may sound fancy, it is actually a much simpler form of cooking than the name might suggest. Sous vide cooking is really as simple as sealing the ingredients in plastic and placing them in a combi oven, water bath, or other type of cooker that is capable of holding a target temperature to within a degree or two. Once the food reaches the target temp or time, you remove it, finish it off, and then serve it to your guests. The process is really that easy. Not only is the method quite simple, but it provides you with results that are almost impossible to get when cooking using a traditional method. It is easy to overcook many types of meat including steak, ribs, pork of any kind, and even chicken. When you use the sous vide method you are going to get perfect entrees each and every time. Not only will the food be cooked perfectly, but it will be perfectly tender and moist, just the way that it should be. Meats and seafood are difficult to cook properly as there is a short window of time and technique that has to be used in order to get it perfect. For example, when frying fish the flesh has a narrow temperature range. The cooking temperature of the pan is going to be much hotter than the ideal temperature of the fish, which means that the edges are going to end up being much more cooked than the center when you are pan frying it. Poultry products need to be held at a certain temperature in order to kill pathogens and make the food safe to eat. When cooking poultry using a traditional method it can be difficult to get it to that perfect temperature. However, when using sous vide you will be keeping the poultry at a target temp for a specific amount of time. This process pasteurizes the poultry, making it safe to eat. Cooking and preserving food in a sealed package is actually an ancient technique. Throughout history food has been potted in fat, wrapped in leaves, sealed inside animal bladders, or packed in salt before it is cooked. For many years people have known that isolating food from the air can be accomplished through vacuum sealing and can lower the amount of decay of the food. In addition, using these packages will prevent the food from drying out. Sous vide as mentioned translates to mean under vacuum. However, the main feature of this cooking method is not the vacuum sealing or packaging, but rather accurate temperature control. Using a computer controlled heater will warm the water to any temperature that is set and can keep the temperature for many hours or even days. There are several advantages of using uniformity of temperature and temperature control when cooking. First, this will allow you to cook the food to an even doneness the entire way through. There will be no dry edges and centers that are rare. Secondly, the results are highly repeatable. One more reason to cook sous vide is that the bag will create a fully humid environment that will braise the food. The ingredients cooked using this method are more tender and juicier. Sous vide does not provide a brown edge, but this can easily be completed by searing off the meat once it has finished cooking. 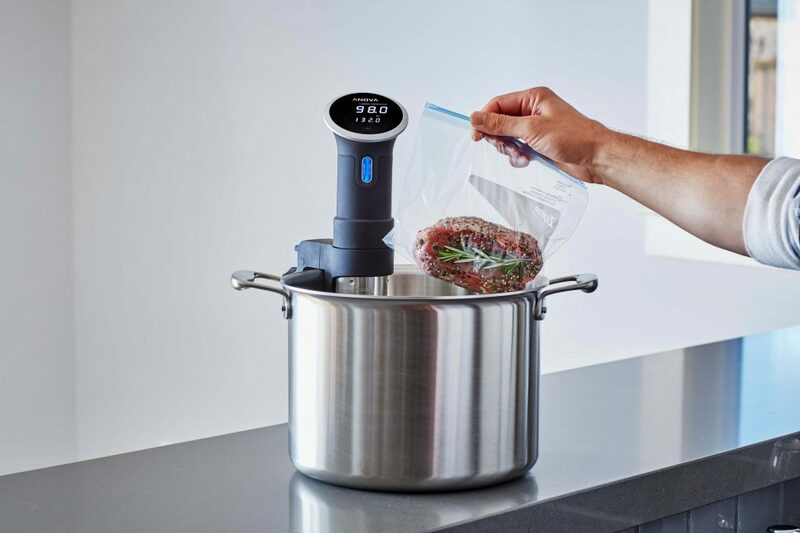 Now that you know what sous vide is and why you should consider learning this wonderful method of cooking, it is time to take a closer look at the essential tools that you will need in order to successfully perform this method of cooking. The immersion circulator is the device that is used to keep the water at the temperature that is desired for cooking. There are 2 main types of immersion circulators. The first type is one that you actually submerge into the pot or container. These look similar to a hand mixer or wand and they are simply clamped to the edge of the pot or container that you are using. This immersion circulator is accurate, incredibly easy to use, and compatible with more vessels than other sous vide cookers. The addition of Wi-Fi makes it possible to set the unit remotely. The other type is essentially an all in one piece. The immersion circulator is inside the container that you are using to cook with. This stand alone unit can be a great choice if you have the room to store it. The wand type takes up less room and can be used with any type of container that you may have. Immersion circulators work by heating the water to the desired temperature and then spitting the water back into the tub. 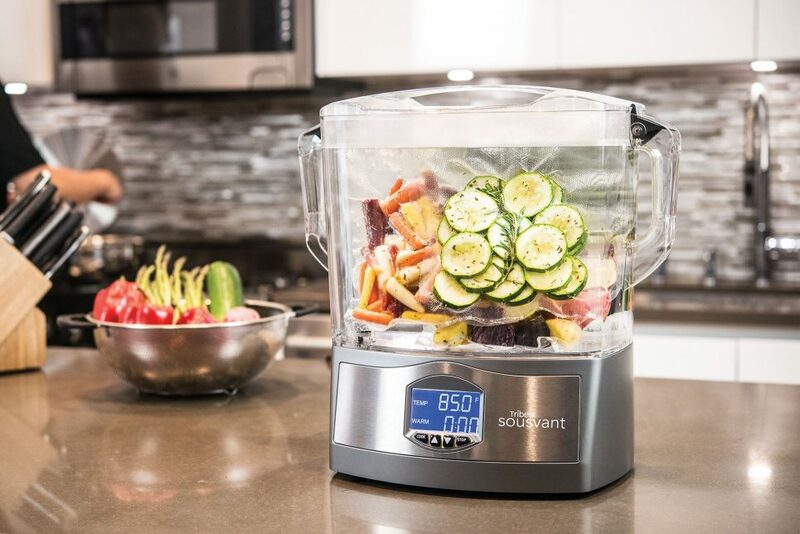 The immersion circulator both heats up the water and circulates it around at the same time. Quality immersion circulators have a degree accuracy that is within a single digit. These devices used to cost thousands of dollars, but now they can be purchased for less than $200. However, the top cookers are going to cost a bit more and are typically worth the investment. The Anova Culinary Precision cooker is one of the best choices when it comes to immersion circulators. It offers highly calibrated circulators, which result in superb temperature stability. It can be used with any type of pot that you have in your kitchen. Another option is the Sous Vide Supreme Demi. This is a good choice for those who are looking for a self contained sous vide machine. This fully self contained unit has a lid that prevents water evaporation and it also offers great temperature stability. The machine is quite compact so it will not take up much space in your kitchen. You can find a list of some of the other top sous vide immersion circulators here. If you choose a wand immersion circulator you are going to need a pot to use with it. While you can use immersion circulators with any type of pot that you have, it is recommended that you use a cambro container. There are many sizes of cambro containers available, from small ones that hold 2 to 4 packages to larger ones that hold many more. A pot is not ideal for sous vide cooking as a cambro container because plastic makes for a better insulator. When it comes down to it, one of the most important aspects of sous vide cooking is the bag that you are cooking the food in. 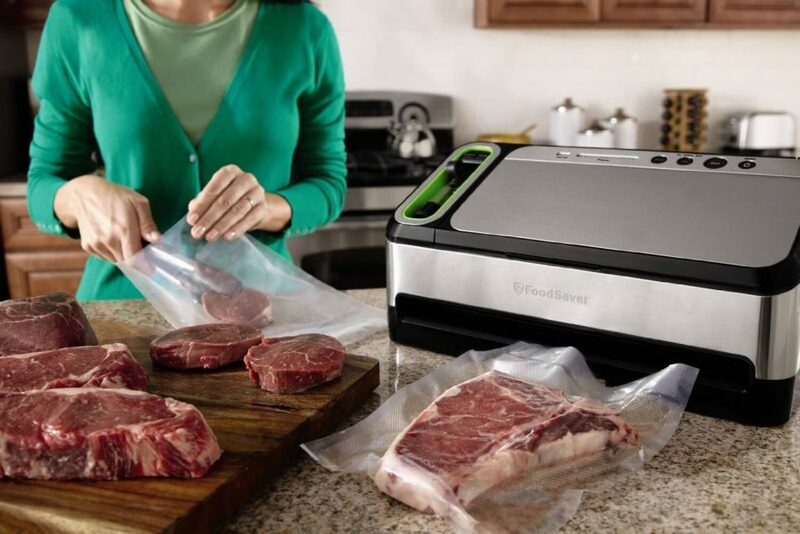 The best sous vide bags will ensure that your food will remain fresh while it is in the freezer or refrigerator. This extends the life of the food and ultimately will save you money. Sous vide bags come in many shapes and sizes as well as different styles. It is important to note that there are some bags that are only compatible with certain types of systems, so make sure that you find bags that are compatible with your machine. If you do not want to invest in a vacuum sealer at first you can simply choose to use freezer bags that have a zip lock. It is important that you choose freezer bags because the seal on the thinner bags will degrade through long cooking times and then your meal will be ruined. If you are planning to use the sous vide method of cooking often you are going to want to invest in a quality vacuum sealer. There are many different types of vacuum sealers available and it is important to choose one that is of high quality. Here you will find reviews of some of the top vacuum sealers available. Chamber vacuum sealers are the top of the line way to vacuum seal your food to keep it from going bad. A chamber sealer will allow you to store food for much longer than you thought was possible and it is very easy to use. When choosing a chamber vacuum sealer it is important to choose the right one. Here you will find reviews of some of the top chamber vacuum sealers on the market. Another piece of equipment that you will want to have on hand when you begin your sous vide cooking project is a quality cast iron skillet. Cast iron skillets offer the best way to provide a deep brown crust on the meat that you cook sous vide. Choose a high quality cast iron skillet to pair with your sous vide cooking and you will not be disappointed. 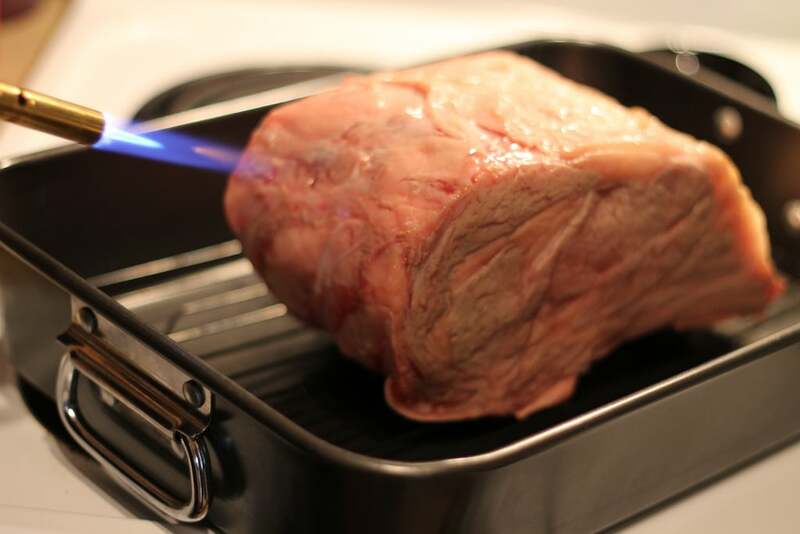 If you want to add a bit of fun to browning your sous vide food, consider purchasing a sous vide torch. The great thing about using a torch is that you will only sear the outside of the meat without affecting what is on the inside. This will allow you to cook a steak that is rare on the inside that has an outside with a perfect chair. There are a variety of sous vide torches available. One of the best is the Bernzomatic TS8000. 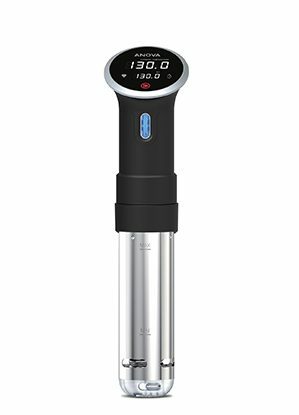 This torch comes with high recommendations from sous vide cooks around the world and offers many great features. You can also learn more about some of the other top sous vide torches by reading this great article about the best torches on the market. After reading the above you may be thinking that getting started cooking sous vide is going to be costly and you would be right. Getting the equipment that you need to start this method of cooking does not come cheap. Finding the right sous vide system is only the first step. Next you need to find all of the other tools to go with it, including the right vacuum sealer if you truly want to do things right. The good news is, there is a sous vide essentials kit available that will provide you with what you need in order to get started. 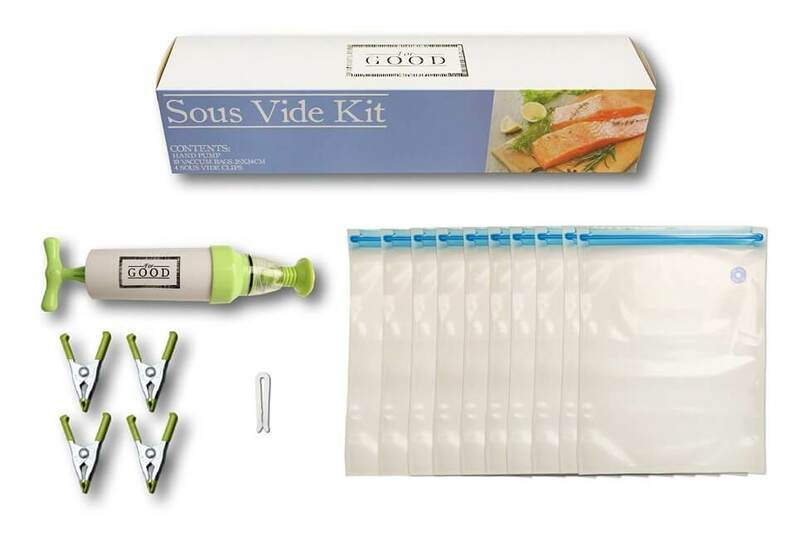 This kit comes with what you need to get started cooking using the sous vide method. As you start cooking sous vide you are going to quickly learn some tricks that make the entire process easier. Of course, learning these tricks will take some time, so here are a few tips to help get you started. When you first start cooking sous vide and have not yet invested in a vacuum sealer it is important to make sure that you get all the air out of the freezer bags that you are using. You can actually use water to help you get the air out of your zip lock bags. The first thing that you will want to do is to close the bag, but not all the way. Leave a small space in the corner of the bag. Next, take the bag and slowly dip it into a bowl of water. The water is going to help push the air out of the bag through the gap. Submerge the bag as deep as possible, but before it is completely underwater close up the gap. You can then remove the bag from the water and all of the air will be out of it. One common difficulty that people have with sous vide cooking is that the bags float. There are a few reasons that the bags are floating. The first reason is that the seal is not perfect. This means that there is air trapped inside the bag to start with. This is most likely to happen when you are using a Ziplock freezer bag. Another reason that a bag may float is because during the cooking process vapor forms inside the bag as water is heating up and starting to evaporate. Air bubbles from the vegetables or meat can also escape and cause the bag to float. Another reason is that the food that you are cooking is not as dense as water, for example extra fatty bacon. When cooking sous vide it is important that the bags stay submerged the entire time as this is the only way to guarantee that the food is heated properly. As mentioned above, one of the best ways to make sure that your bags remain submerged in the water is to use a binder clip at the bottom of the bag. Place a spoon through the clip and the weight of the spoon will help keep the bags submerged. 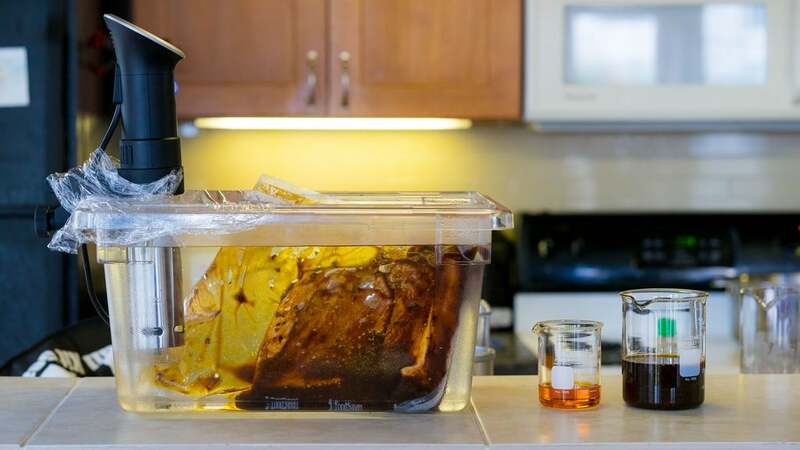 If you have something that is going to be cooking sous vide for a long time, chances are that the water in the container may dip to a low level and cause the circulator to stop. This will interrupt the cook time and can risk the safety of the food. There are several ways that you can prevent evaporation when cooking sous vide. One way to prevent evaporation is to cover the water with aluminum foil or plastic wrap. You can also cut a hole out of a lid that fits over the pan that you are using. Another easy solution is to dump some ping pong balls into the water. The ping pong balls will float on the surface, which insulates the water. One of the nice things about this method is that the ping pong balls will conform to the container and they allow you to easily drop bags in or pull them out when necessary. These are only a few of the things that you can do to improve your sous vide cooking experience. As you go along you are going to find that you will come up with different methods to improve your sous vide cooking experience. Pork is a difficult meat to cook traditionally. It has a reputation of being dry and bland. This is not the case when you cook pork sous vide. It is easy to make some awesome pork entrees using the sous vide method. Some cuts of pork that work well sous vide include tenderloin, loin roasts, and pork chops. Cook pork at 140 degrees F for a little bit of pink. Up the temperature to 141 degrees F if you want no red at all. Here you will find a great recipe for sous vide pork tenderloin. Another great piece of meat that is excellent when cooked sous vide is chicken breasts. Cooking chicken breasts using traditional methods can be difficult. This piece of meat is easy to overcook or even worse, undercook. Using the sous vide method to cook chicken breasts ensures that you will get perfectly tender and juicy chicken every single time. Typically, chicken breasts should be cooked for two to four hours at 141 degrees F. This temp and time will provide you with great chicken breasts every single time. Once the chicken is cooked you can eat it straight from the bag if you prefer or if you want you can sear it off in your cast iron skillet. 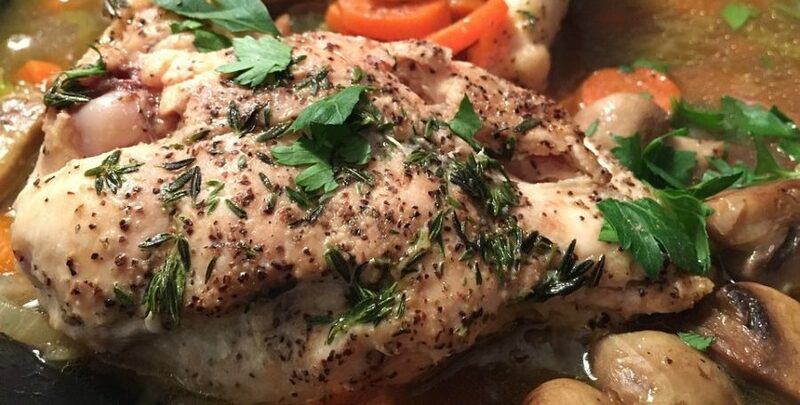 Here are some great chicken recipes to help get you started. Another meat that is difficult to get right when cooking with a traditional method is sausage. The timing of getting sausage to cook well on the inside with a nice brown outside can be difficult to get exactly right. Sous vide cooking takes the guesswork out and leaves you with sausages that are perfectly cooked. Cooking time for sausage is around two to four hours at a temp of 140 degrees F. This temp and time will leave a bit of pink in the middle, but it will be safe to eat. This also provides a bit of leeway when you are searing the sausages off. Chuck roast is a meat that benefits from a long cooking time, which is perfect for the sous vide method. You can create a braised chuck roast by cooking it at 160 degrees F for around 24 hours or chuck roast steaks can be cooked at 131 degrees F for 2 days. Here is another chuck roast recipe that you can try. 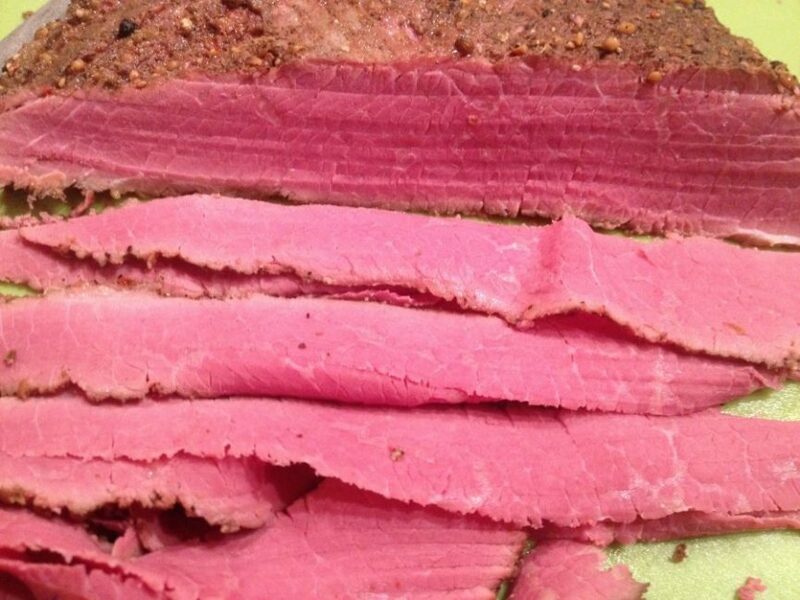 A lot of times when cooking corned beef it can become very dry. Sous vide allows you to control the temperature and create a tender and moist corned beef that you are sure to enjoy. For a tender and somewhat drier corned beef cook it at 146 degrees F for several days. If you prefer it more moist lower the temperature to 135 degrees F.
There is nothing quite like a good medium rare burger. However, ordering a burger cooked to this temp can have some safety issues. 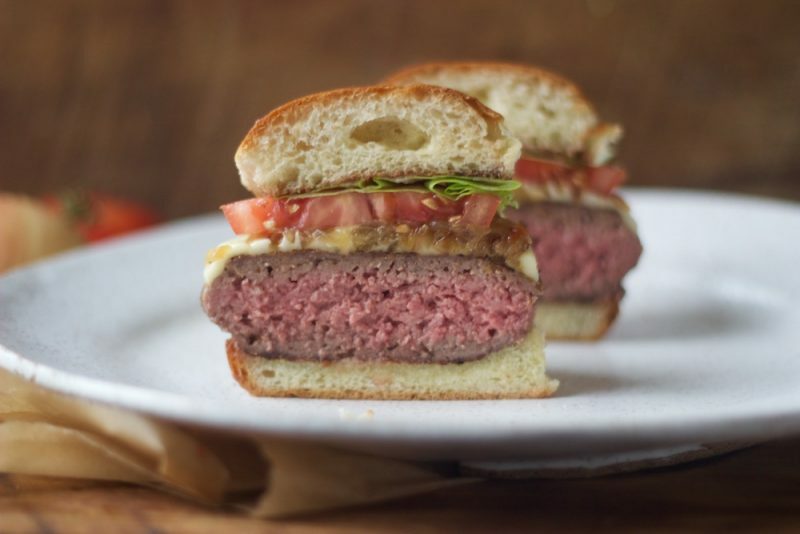 One of the great things about cooking a burger sous vide is that you can cook the burgers long enough to pasteurize the meat, which will make it safe to eat at a good medium rare temp. If you cook burgers for two or three hours at 131 degrees F and then sear them quickly you will end up with a great medium rare burger that is extremely juicy. Cooking seafood sous vide is simply wonderful. The great thing about using sous vide for sea food is that it does not take long and there are many great ways to prepare it. 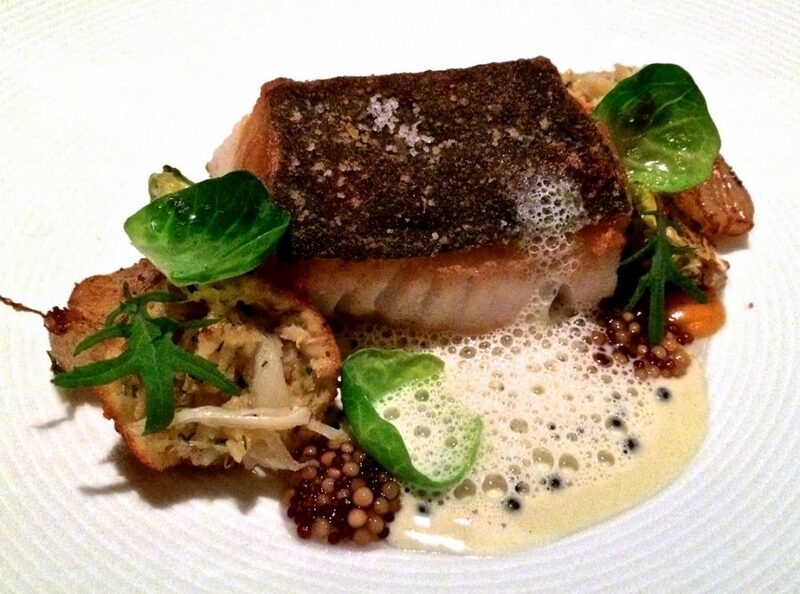 You can cook all types of fish and other seafood using your sous vide kit. Here is a great cod recipe to help get you started. The above tips about cooking times and temperatures are just enough to help you get started. However, if you truly want to delve into the art of cooking sous vide you are going to need to invest in some quality sous vide cookbooks. A good quality sous vide cookbook is going to help guide you through the ins and outs of using your sous vide machine to the best of its ability. After all, you do not want to break your sous vide machine simply because you did not use it correctly. In addition, you do not want your food to become spoiled or burned because you have pushed the wrong button. A good cookbook will provide you with the instructions that you need and teach you little tricks to use so that you enjoy your sous vide machine. Sous Vide at Home: The Modern Technique: This book is written by Lisa Q. Fetterman. Fetterman is best known for founding Nomiku, which is the company that offered the first immersion circulator in the industry. The 288 pages provide information and guides to creating some great sous vide meals. Modernist Cooking Made Easy: Sous Vide: this sous vide cookbook was written by Jason Logsdon. The focus of this book is on low temperature cooking and this book has long been thought to be the best choice when it comes to sous vide cookbooks. There is a ton of information available in the 284 pages. Under Pressure: Cooking Sous Vide: Written by Thomas Keller, this book came out in 2008, making it one of the first cookbooks of this type. The book is 295 full pages of information about sous vide cooking. Here are some of the common questions that people have about cooking sous vide. What are some of the cons of cooking sous vide compared to a traditional cooking method? After reading all of the benefits of cooking sous vide you may be wondering if there is anything wrong with this method of cooking. As with anything in life, nothing is perfect and there are a few cons of the sous vide method. First, this method of cooking takes a long time. 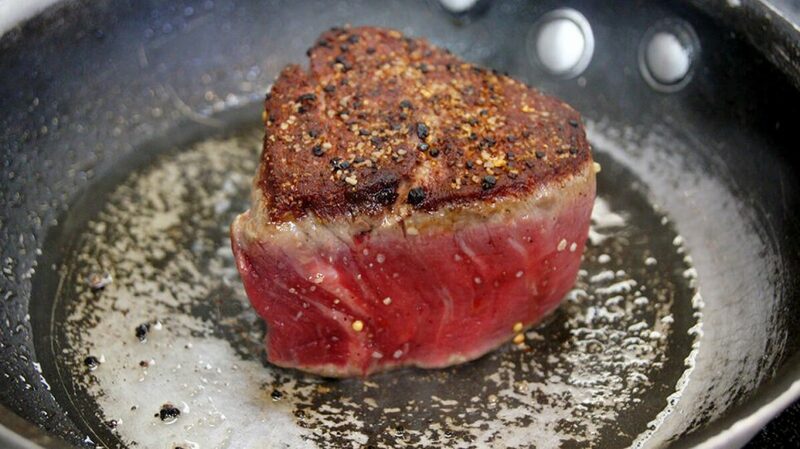 For example, to traditionally cook a steak it will take you about fifteen to twenty minutes to get it to the plate. Using the sous vide method to cook a steak is going to take well over an hour. Using a smoker for a pork shoulder will take six to eight hours, while cooking the same pork shoulder sous vide can take more than a day. It is important to note that while sous vide does take longer, almost all of the time is hands off. Another problem is that no matter what the sous vide zealots say you are not going to be able to get the same sear on your meat as you can with traditional methods. The sear after cooking sous vide is going to thinner than that of a more traditional cooking method. Finally, one of the big concerns and the reason that most people do not get started cooking sous vide is because of the equipment that is required. In addition to all of the traditional tools required for cooking you also need an immersion circulator and a vacuum sealer. When do you season the meat? Can you add salt to the bag before freezing or storing? When most people think of salt they think of it as a simple flavoring agent. However, it is much more than that. Salt can impact the texture of the meat as it will dissolve the muscle proteins as it is working its way inside. Seasoning meat right before bagging it and cooking it will have very little effect. However, salting meat and storing it can dramatically affect the texture, turning it from being raw and meaty to becoming more firm over time. Some people do not like the texture of meat that has been salted and stored, while others are okay with it. For meats that you would brine such as pork, fish, or chicken, salting is typically okay. If storing red meat and you want to avoid the harder texture you will want to season it right before you cook it or after you have cooked it sous vide and before you sear it. How do you really know how long to cook food sous vide? When you are looking at recipes for sous vide you are going to find that often times there is a wide range of times given for this type of cooking. The reason for this is because sous vide cooking is very forgiving. If you see a recipe that states one to four hours for the cook time the reason is because within that time range there is going to be very little to almost no difference in the safety or quality of the food. If you cook it for longer than the recipe states there are no real health concerns associated with the food. However, if you cook it for much longer you will notice a difference in texture. For the best results do not cook the recipe for longer than the recommended time. Is it really safe to cook in plastic? The safety of plastic cooking bags is something that many people are concerned about. When it comes down to it, the bags that are made specifically for sous vide cooking are safe to use. Oven bags, many top brands of zip top bags, and stretchy plastic wrap are all safe to use for sous vide cooking as well. These products are made from a product called polyethylene. Polyethylene is often used in containers found in chemistry and biology labs and it has been extensively studied. It is safe to use. Avoid using cheap plastic wraps when you are cooking. Cheaper plastic wraps are made from PVC (polyvinyl chloride) and heating this can present a risk of the chemicals from the plastic leaching into your food. Can I cool and reheat food that has been cooked sous vide if the bag has not been opened? If food is cooked at a temperature of 130 degrees F or higher and for at least several hours, the contents of the bag should be almost sterile. This means that chilling the bag and then reheating it should not pose a significant health risk. However, doing this can affect the results. For a traditionally slow cooked meat such as a pork shoulder or chicken thigh, there is no real problem. However, for a quick cooking meat such as fish or other seafood, steaks, chicken breasts, and chops, cooling and heating the bag can cause the meat to dry out. Note that any food that has not been held or cooked at a temp of 130 degrees F or above should not be chilled and reheated as the temperatures are not high enough to destroy any dangerous bacteria. Can bagged food be cooked straight from the freezer? One of the nice benefits of cooking sous vide is that you can vacuum seal your bags and throw them in the freezer to use at a later date. You can pull the bag directly from the freezer and put it in the water bath to cook. There is no need to thaw the bag first. However, you will need to make sure that you add a bit of time to the cooking. For a thick chop or steak it may take an extra 30 to 60 minutes. For thin chicken breasts or shrimp add about 15 minutes to the cook time. Overall, sous vide cooking is a very forgiving method of cooking. The entire process is extremely simple and just about anyone can pick it up quite quickly and easily. Once you have found an immersion circulator and a vacuum sealer to use, the possibilities are really endless. There are many great recipes available to help you get started and you should also consider a good quality sous vide cookbook. The great thing about sous vide is that you can learn as you go. When you are starting out you are likely to make a few mistakes, but the nice thing is, most of the time these mistakes are not huge and you are still going to get a great meal to eat. Unlike using a traditional cooking method where you would throw the food out, sous vide allows you to easily cook a good meal with very little effort. This entry was posted	on Monday, May 15th, 2017 at 8:00 am	and is filed under Food Trends, Tips. You can follow any responses to this entry through the RSS 2.0 feed. Responses are currently closed, but you can trackback from your own site.